"I WANTED TO SERVE, TO BE PART OF THIS THING MY FATHER HAD GIVEN HIS LIFE FOR. I DIDN'T WANT THE WAR TO END, AND ALL I'D BE ABLE TO SAY WAS, NO I DIDN'T SERVE, I WAS RIGHT HERE THE WHOLE WAR, SAFE IN BAKERSFIELD." Adam Pelko witnessed the Japanese attack on Pearl Harbor that killed his father, a lieutenant on the USS Arizona. Even though Adam is underage, he defies his mother's wishes and enlists in the Marines. Sent first to boot camp, then to Okinawa, he experiences the stark reality of war firsthand -- the camaraderie and the glory as well as the grueling regimen, the paralyzing fear, and death. And at every turn, Adam must confront memories of his father. 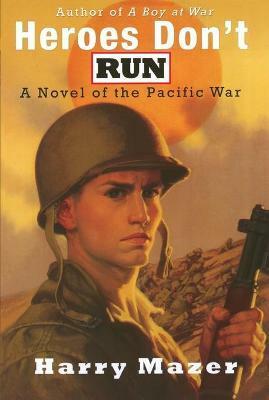 In the concluding volume of his World War II trilogy, Harry Mazer masterfully illustrates Adam's journey as he navigates brutal circumstances that no boy should know. Rosie in Los Angeles: Action!